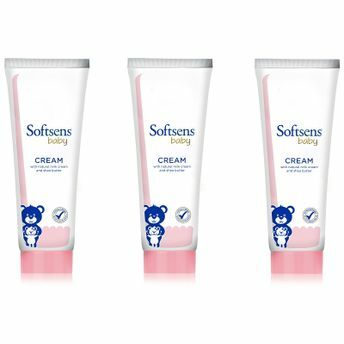 Softsens Baby Rich Cream helps keep your baby's skin just the way it should be: soft, smooth and kissable! Enriched with the goodness of Natural Milk Cream and Shea Butter, this lightly fragranced mild formulation gently replenishes lost moisture into the skin, thereby moisturizing even the most dry and sensitive skin, leaving it supple, nourished & well-hydrated. Leaves the skin nourished & well-hydrated. Enriched with Natural Milk Cream and Shea Butter. Completely safe with no harsh chemicals. Non-greasy formulation, making it perfect for all skin types, sensitive, dry or allergy-prone.